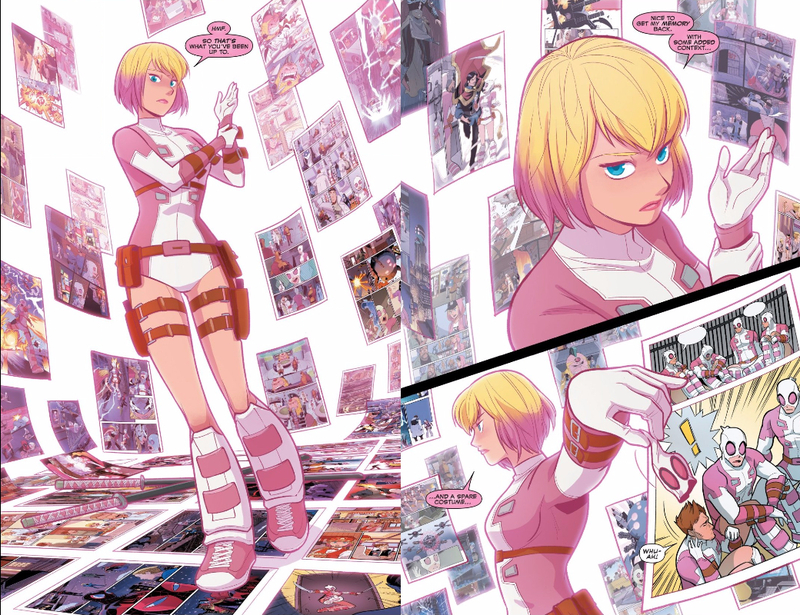 When Gwenpool was first announced, I assumed she would just be a meme, a jokey mash-up of Deadpool and Spider-Gwen. 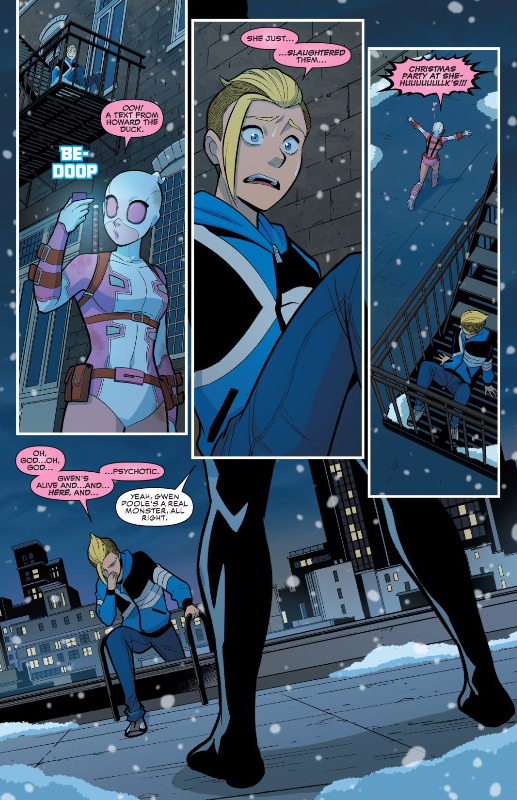 Throughout The Unbelievable Gwenpool, though, Christopher Hastings and Gurihiru have made Gwen a compelling character in her own right, primarily by treating even her zaniest personality traits and adventures with respect and gravitas. This includes Gwen’s knowledge of Marvel’s fictional existence; while Deadpool’s breaking the fourth wall is treated as a fun in-joke with no bearing on the plot, Gwen’s ability to do so has not only become one of her greatest advantages as a fighter, but has now essentially made her a god. This development began last month as Gwen unspooled the reality of her fictional home, but becomes a full-fledged reveal in this month’s Unbelievable Gwenpool 18. Gwen’s knowledge has always been the only thing protecting her from the dangers of the Marvel universe, but her newfound omnipotence allows her to discover that her “home” is now fictional too — something even Teddy, who helped set up this “trap,” doesn’t know. Of course, while Gwen’s encyclopedic knowledge of the Marvel universe’s inner-workings has always been her greatest strength physically, it’s also been her greatest weakness morally. We’re reminded of that through Teddy; the first half of this issue reveals that Teddy was also teleported to the Marvel universe way back when Gwen was, and though he’s struggled (essentially surviving as an undocumented worker) while Gwen’s slowly learned to thrive, he also kept his morality in a way Gwen didn’t. We’ve seen Gwen begin to grow past this mindset as she’s matured, but gaining control over her reality is implied to be one giant step backwards for her. 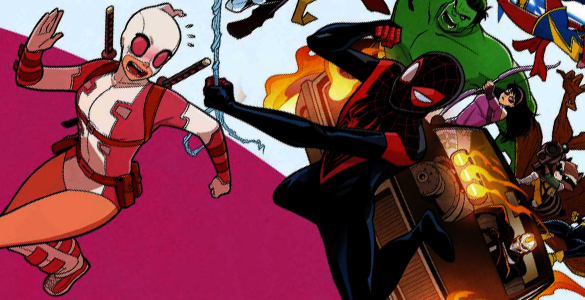 The future versions of Miles Morales and Terrible Eye tell Teddy that Gwen’s powers will destroy their lives and crumple their reality like paper. Knowing Gwen like we do, it’s easy to believe their statement, even as we know that Gwen isn’t being purposefully malevolent. I suppose that doesn’t really matter when lives are at stake, fictional or otherwise. Adult Miles looks weird… With new, adult physical build, something felt missing. I mentioned before that this arc seems to be about Gwen developing the way she consumes comics to a more mature level. That after everything, she is going to learn not to fall for the vicarious escapism and instead have a more mature approach – an approach that will eventually let her end her arc mature enough to become the writer she wants to be. But before she can grow up and reach that level, she has to confront what she used to be. Only by making a concerted effort to understand what she was can she truly become better. Because Gwen has been running round the Marvel Universe, ruining everyone else’s lives. Even as she tried to improve herself, she still slaughtered people with wild abandon. Still caused great problems to heroes out of a wish to exploit her knowledge for her own kicks. And now, with the power of a god, Gwen must realise that with greater understanding (and therefore power), there must also be that classic Marvel concept to go alongside it, Responsibility. The future squad represents what happens if Gwen doesn’t properly address that her actions don’t just affect her friends in MODOK, but the entire Marvel Universe. Unlike Teddy, Gwen came into the word obsessed with the idea of escapism. And this has let Gwen ‘thrive’. But Teddy understands something important that Gwen still hasn’t. 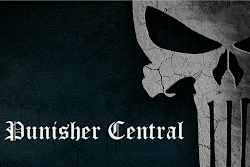 The Marvel Universe is real. Teddy may not have had a good life, but he had a moral life. One that acknowledged the reality of the world he lived in, and therefore he endeavoured to do the best he can. He is the counterpoint, and Gwen’s actions feel much darker from his perspective. Because from Daddy’s perspective, Gwen is ignoring the reality of the world for her escapism. This may be the Marvel Universe, but those men in suits are still real people. And in facing Teddy, the person who understands that, Gwen must truly acknowledge that and understand that she needs to get better. The final test of this stage of her character development. And if she doesn’t pass? Can you imagine how scary a Gwen with the powers she has will be? I actually loved adult Miles’ build. He looks like something out of a Bruce Timm cartoon! I don’t want it to be his regular design because I want him to stay a kid for a long time, but it’s great as an “adult” design because you can immediately tell he’s an adult Miles without changing his costume or showing his face. It is a fantastic example of how much you can imply with just a change in build. The costume can stay the same, if you know how the draw everything else. But Miles design, which was originally so fantastic and dynamic in the ways it interpreted one of Marvel’s most iconic costumes. But gives Miles adult proportions, and you instantly realise how, unlike Peter, there is so little actual design on his lower half. THe cosutme feels slightly empty because of it.